For top quality brake repair, Sacramento drivers turn to OK Tire & Automotive! 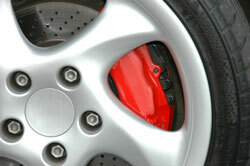 Your vehicle's brakes are essential in keeping you and your family safe on the road. That's why it's important to choose a brake shop who knows how to provide the highest quality brake service Sacramento has to offer. That's where the brake system experts at OK Tire & Automotive come in. Whether you commute in Fair Oaks, Carmichael, or Citrus Heights, we've got you covered'! We guarantee our brake service & repairs! OK Tire & Automotive is a family owned and operated auto repair shop, dedicated to keeping our community driving safely! With OK Tire & Automotive you know that your vehicle is in the best hands. Not only are our mechanics all highly experienced, ASE Certified Technicians, but we are so confident in our brake services that we back them by a 24,000 mile/24 month guarantee! We're driven to keep you driving safely. There are many reasons why you should have your breaks service regularly, and our dedicated auto mechanics are happy to talk to you about the repair or maintenance services they are performing on your car's brake system, as well as ways to help them last longer between replacements! Whether you have a car, truck, minivan, SUV, crossover or hybrid, your vehicle's brakes are not something you should take a chance with. If you feel that something might be wrong with your vehicle's stopping power, give us a call immediately or easily schedule your brake service online. Your safety is our main priority!